It's a lazy-susan for potted plants and can easily rotate a heavy pot. The 12" pot turner holds up to 250 lbs and the 16" up to 400 lbs. Yes, you read that right! It makes turning your pottery easy. 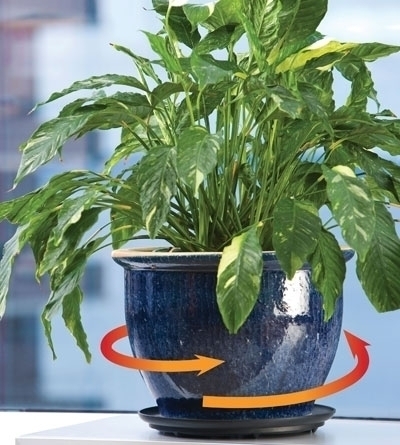 Everyone knows turning containers promotes healthier plants with 360 sun exposure. An added bonus is it will protect flooring from water damage just like a plant saucer. Like to decorate your patio with large HEAVY pots overflowing with flowers & greens? Use a plant turner and no lifting is required! * 2 sizes - 12" & 16"